Each year on Memorial Day most of us, at one time or another, have witnessed the commemorative laying of the wreath at the Tomb of the Unknowns. On Nov. 11, 1921, an unidentified soldier who had been killed in France was buried there in a temporary crypt over which a marble slab was placed. 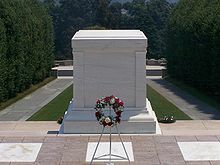 The completed tomb was dedicated as the Tomb of the Unknown Soldier on Nov. 11, 1932. What most of us don’t know is how that original unidentified soldier was transported from France to the United States. That unknown soldier was delivered to Washington D. C. by the USS Olympia. The Olympia is the oldest steel warship afloat in the world. She was launched in San Francisco, CA, in 1892. 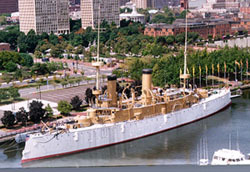 Today she resides dockside at the Independence Seaport Museum in Philadelphia. On May 1, 1898, Olympia devastated a Spanish fleet at Manila Bay in the Philippines, beginning the Spanish-American War. Olympia helped catapult the United States into the role of superpower and won fame for her most famous officer, Commodore George Dewey, who was later promoted to Admiral. It was from Olympia‘s bridge that Dewey delivered his famous order, “You may fire when you are ready, Gridley.” Olympia also served her country during World War I.
Cruiser Olympia was decommissioned in 1922 and has been part of Independence Seaport Museum’s Historic Ship Zone since 1996. Olympia is a National Historic Landmark, a National Historic Mechanical Engineering Landmark, is on the National Register of Historic Places, and is part of the Save America’s Treasures program. An iconic symbol of American history, Olympia now risks sinking at the dock and being forever lost. Her hull is severely corroded, compounded by weather leakage through her rotted exterior deck. She has not been hauled since 1945 and currently has 62 patched holes below the waterline and two compartments that are flooded. Because Olympia has not been out of the water for more than 60 years, she is in critical need of dry docking for major hull repair and exterior deck replacement. The entire restoration project, which also includes visitor and educational enhancements, will cost $19.5 million. This project will be a significant regional economic stimulus. Multiple industries and workers will be required to perform the dredging, towing, ship repairs, and visitor enhancements, plus the newly refurbished Olympia will spark increased attendance and revenues for local and regional tourism. Now is the time to memorialize this fading piece of history by saving her. If you want to protect this national treasure please contact the Independence Seaport Museum with your donations. Boat Owners Association of The United States (BoatUS) has launched a new online website for recreational boaters affected by the Gulf oil spill which can help them stay informed, safeguard their boats, and assist with recovery efforts. The new website, www.BoatUS.com/oilspill , brings together a range of public and private resources and information for boaters, including how to protect your boat and the environment as well as boat cleanup tips. A unique live “observation map” allows boaters to email updates of local conditions, which are then posted for public viewing. 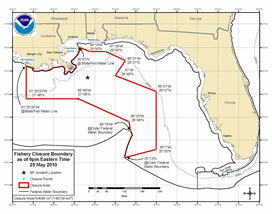 The map also includes reports from TowBoatUS towing ports and BoatUS Cooperating Marinas along the Gulf Coast. “This is the one place where boaters can find out everything related with the oil spill,” said BoatUS Director of Damage Avoidance Bob Adriance. A NOAA Trajectory Map shows daily forecasted movement and locations of the oil spill, and volunteer opportunities are also posted as well as fishing restrictions and claims information for boat damage. Additionally, included are links to the most current information from a diverse range of state and federal government resources including the official Deepwater Horizon Response website, as well as news updates, video footage, and other reports. For more information, go to www.BoatUS.com/oilspill . The U.S. Coast Guard Captain of the Port of New York and New Jersey is establishing Naval Protection Zones and Safety Zones on the Upper New York Bay and Hudson River for the 2010 New York Fleet Week. The potential exists for unanticipated delays affecting ship movements and/or the control of vessels with little or no warning within the Port of New York and New Jersey from Wednesday, May 26, through Wednesday, June 2, 2010. 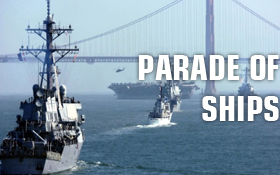 “We want to encourage boaters to enjoy the Parade of Ships during Fleet Week, but are urging everyone to be safe and respect the established safety and security zones while on the water,” said Lt. Cmdr. Ed Munoz, Coast Guard Sector New York Chief of Waterways Management. During the May 26 Parade of Ships, all vessel traffic in the Hudson River shall transit to the west of the parade column while naval vessels are in transit on the Hudson River. All vessels shall operate at the minimum safe speed necessary to maintain course and shall proceed as directed when within the 500 yard safety/security zone. The Coast Guard Cutter Abbie Burgess will be managing the overall Parade of Ships security for participants. Additional details regarding the Naval and Coast Guard vessels involved in the Parade of Ships can be found here: http://homeport.uscg.mil/newyork. Commercial passenger vessels on established ferry routes and other vessels will be permitted to cross ahead or between naval vessels while they are in parade formation at a 250 yard distance with Patrol Commander permission. All traffic shall not enter within 200 yards of any moored U.S. naval vessel. No vessels are authorized within the restricted area around the Stapleton Homeport Pier on Staten Island from 8 a.m. Tuesday, May 25 through 8:00 p.m. Wednesday, June 02, 2010. No vessels are authorized within 250 yards of the Manhattan Cruise Terminal on the Hudson River between the south east corner of Pier 86 and the northeast corner of Pier 92, from 4 a.m. Tuesday, May 25, through 8 p.m. Wednesday, June 02, 2010. There is a scheduled 11-gun salute from the USS Iwo Jima near Fort Hamilton at 8:24 a.m. and a rendering of honors at the World Trade Center site at 9:09 a.m. Wednesday. The Federal Anchorage 19 (Hudson River), Federal Anchorage 23 Bravo (Stapleton section 3) and Federal Anchorage 25 (Gravesend Bay) will be closed to commercial vessels starting at 4 a.m. Wednesday. The Federal Anchorage 19 (Hudson River) and Federal Anchorage 25 (Gravesend Bay) are scheduled to reopen following the parade of ships and mooring of vessels at Manhattan Cruise Terminal. Federal Anchorage 23 Bravo, section 3 (immediately adjacent to the Staten Island Homeport Pier) will remain closed during Fleet Week until the last naval vessel has departed. Ambrose Channel will be closed to outbound traffic from 6 a.m. to 11:30 a.m. and closed to inbound traffic from 7 a.m. to 11 a.m. Wednesday May 26, 2010. Entry into or movement within these zones is prohibited without the authorization of the Coast Guard Captain of the Port or the designated on-scene representative. Persons violating this regulation are subject to a penalty of up to $50,000 and/or imprisonment for not more than five years. For the most up to date information on current restrictions please contact the VTS NY at (718) 354-4088. To view a chart of the Stapleton Homeport Pier restricted areas click here. To view a chart of the New York City Passenger Ship Terminal restricted areas click here. Additional waterway information is available at: http://homeport.uscg.mil/newyork. On May 20, 2010 we anounced the upcoming Hurricane Preparednes Week. In that light we give you a little hurricane history. The first recorded and worst in number of deaths was the Galveston Hurricane of 1900. The most covered by the media was Hurricane Katrina of 2005. Being the first on record, this killer weather system was first detected over the tropical Atlantic on August 27, 1900. While the history of the track and intensity is not fully known, the system reached Cuba as a tropical storm on September 3 and moved into the southeastern Gulf of Mexico on the 5th. A general west-northwestward motion occurred over the Gulf accompanied by rapid intensification. By the time the storm reached the Texas coast south of Galveston late on September 8, it was a Category 4 hurricane. After landfall, the cyclone turned northward through the Great Plains. It became extratropical and turned east-northeastward on September 11, passing across the Great Lakes, New England, and southeastern Canada. It was last spotted over the north Atlantic on September 15. This hurricane was the deadliest weather disaster in United States history. Storm tides of 8 to 15 ft inundated the whole of Galveston Island, as well as other portions of the nearby Texas coast. These tides were largely responsible for the 8,000 deaths (estimates range from 6,000 to 12,000) attributed to the storm. The damage to property was estimated at $30 million and remember that was in 1900s dollars. Katrina was one of the most devastating hurricanes in the history of the United States. It is the deadliest hurricane to strike the United States since the Palm Beach-Lake Okeechobee hurricane of September 1928. It produced catastrophic damage – estimated at $75 billion in the New Orleans area and along the Mississippi coast – and is the costliest U. S. hurricane on record. Although Katrina received the most on-air coverage lasting months after she departed New Orleans, don’t forget that their were four hurricanes in 2005, Dennis, Katrina, Rita and Wilma. Beginning July 1, 2010 anyone born after January 1st, 1984 must successfully complete a boating safety course before getting behind the controls. Additionally, if you don’t have a drivers license it is illegal to operate a boat. The current law requires that all persons born after January 1, 1988, must complete a boating education course and carry proof of completion to operate a motorboat in excess of 10 horsepower. The person may operate the boat if accompanied by someone over 18 years of age who, if required, has completed the course. State Natural Resources officials are considering mandatory training for new boaters. The proposals would require changes in state law. Under review is requiring a basic boating safety course before anyone new to boating takes to the water. South Carolina is among 13 states lacking what the National Transportation Safety Board considers satisfactory boater education standards. Current law only requires those ages 15 and younger take a safe boating course. It is optional for everyone else. Better education is important as state Natural Resources officers, charged with patrolling waterways, are stretched thinner. The number of Natural Resources officers has fallen to 200, down nearly 100 in the past five years due to state budget cuts as the state’s income has fallen. A new boating rule in Wisconsin is designed to make lakes safer while protecting shorelines and improving water quality. The law, new for this year, prohibits boaters from operating their boats at speeds greater than slow-no-wake within 100 feet of lake shorelines. The law applies to all lakes. Slow-no-wake is defined as the minimum speed required to maintain steerage. Boats operating in shallow waters often churn up sediment and chop up vegetation, decreasing water quality and potentially spreading invasive aquatic species like Eurasian water-milfoil. Slowing these boats will reduce this problem. In addition, eliminating wake near shores can reduce shoreline erosion. This change is in addition to a current law which already prohibits boaters on lakes from operating at speeds greater than slow-no-wake within 100 feet of docks, rafts, piers and buoyed restricted areas. Personal watercraft operators must also follow these laws in addition to speed restrictions that apply specifically to personal watercraft. Personal watercraft operators cannot operate at a speed greater than slow-no-wake within 200 feet of the shoreline of any lake. They also are required to cut back to slow-no-wake speed when passing within 100 feet of other boats, including other personal watercraft. This law applies to both rivers and lakes. The Coast Guard Marine Safety Laboratory in New London, Conn. analyzed a sampling of tar balls discovered on Florida Keys shoreline Tuesday and determined that none of the collected samples are from the Deepwater Horizon oil spill. Capt. Pat DeQuattro, commanding officer of Sector Key West, authorized the use of the Oil Spill Liability Trust Fund to commence cleanups of any oil pollution on Florida Keys shoreline and established a Unified Command comprised of members from the Coast Guard, the National Oceanic and Atmospheric Administration, the Department of the Interior, the Florida Department of Environmental Protection and Monroe County to manage the Florida Keys Tar Ball Incident response. May 22, 2010 marks the beginning of National Safe Boating Week. This years focus is once again on encouraging boater to wear a PFD whenever they are on the water. 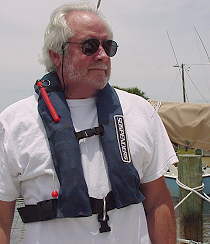 The U.S. Coast Guard, in September 1996, approved manually activated inflatable life jackets. Approval as Type III PFDs (personal flotation devices) meant boaters didn’t have to wear them, just carry one per person on board. In August of last year, the USCG Life Saving and Fire Safety Standards Division approved life jackets that inflate automatically when they come into contact with water. These were approved on a conditional basis. As Type V PFDs, they may only be counted toward the Coast Guard requirement of one per-person, only if they are worn. If you choose an auto inflatable you are required to wear it at all times or keep an additional inherently buoyant life jacket or Type III inflatable aboard to be in compliance. Four manufacturers now have Coast Guard approved Type V automatic inflatable life jackets on the market. Three also offer them with built-in offshore safety harnesses. Unlike the familiar inherently buoyant vest, inflatables use a carbon dioxide (CO2) cylinder to blow up an air bladder. In the auto inflatables, the bladder encircles the neck and is cinched to the torso with straps over the shoulders and across the back. They are designed to float the average adult with their head out of water and turn most people face-up. All have oral inflation tubes as well. Being light weight and more comfortable than ever there is no reason not to be prepared by wearing and inflatable PFD. When shopping for an inflatable PFD make sure to check that it is indeed USCG approved.